Heat 1 Tbsp. oil in a medium pan over medium heat and cook panko, stirring, until golden, about 5 minutes. Season with salt and pepper; transfer to paper towels to drain and toss with dill and lemon zest. Meanwhile, mash anchovies and garlic to a paste on a cutting board with the side of a chef's knife. 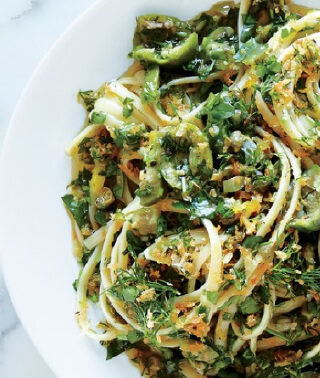 Combine with parsley, basil, and half of olives and capers in a large bowl. Chop remaining olives and capers and add to bowl, along with remaining 1/2 cup oil. Mix well; season sauce with salt and pepper. Add pasta and 1/4 cup reserved pasta cooking liquid to sauce. Toss, adding Parmesan a bit at a time, along with more pasta cooking liquid as needed, until sauce coats pasta. Add lemon juice; season with salt and pepper. Serve pasta topped with panko and more Parmesan.